According to the police, 46 people died the spot while six lost their lives on the way to hospital Wednesday evening after two buses crashed head-on close to the Rusape toll gate along the Harare-Mutare highway. "Following the tragic accident Government has released $25 000," said Civil Protection Unit director Nathan Nkomo. "We have increased the amount from $200 to $500. We have also established a command centre in Rusape. "The Insurance Council will also release some funds towards the cause." "The use of vehicles that are not roadworthy, or drivers who do not seem to care for passenger safety, amount to criminal breach of trust between bus operators and paying commuters who expect and deserve safe transit," he said. 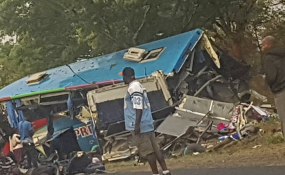 "Both the responsible ministry and our law enforcement agents must use this bloody accident to close in on all bus operators, drivers and road users who put profit and speed above life, thus causing avoidable carnage on our roads." He added; "In view of the magnitude of the loss of human life in this one incident, I have since directed that the responsible ministry takes steps to declare this accident a national disaster in order to enable the mobilisation of resources both for treatment of all those injured, and for support to families which have lost their loved ones." "I am deeply shocked to learn of the accident," he said. "The scale of the tragic loss of life is unacceptably high. The Civil Protection Directorate is working with the Insurance Council of Zimbabwe on the assistance to be rendered to the bereaved. "All necessary measures will be taken to assist the affected." And in a statement, the main opposition MDC party said; "The President Adv. Nelson Chamisa and the entire MDC family joins the nation in mourning 47 compatriots who died in the Rusape bus accident. Their passing is untimely; the loss of life is sad, painful and leaves life-long negative impact not only for the families but the Zimbabwean community. We share the pain of the families of the deceased." "We therefore express our condolences. Our thoughts and prayers are with these families. We recommit the party to contributing to the fight against road carnage and may their families find comfort in these trying times." From across the border, South Africa president Cyril Ramaphosa said; "On behalf of the people of South Africa, we send our deepest condolences to the Zimbabwean Government particularly the families who lost their loved ones. "Our prayers and thoughts are with you and we wish you (people of Zimbabwe) strength during this time of grief."